By Angie Drobnic Holan on Wednesday, January 29th, 2014 at 9:00 a.m.
We suspected that President Barack Obama was the most fact-checked person on the Truth-O-Meter, but we confirmed it when we compiled data to mark the 500th time we’ve fact-checked him. Curious about who else has been fact-checked most often? We were, too. So we created a list of the Top 10 most fact-checked people on the Truth-O-Meter, which includes our state affiliates. Numbers are accurate as of Jan. 22, 2014. As you might suspect, we fact-check presidential candidates the most frequently. Since our 2007 launch, we’ve fact-checked Obama the most, followed by 2012 Republican nominee Mitt Romney and 2008 nominee John McCain. Readers often ask us to fact-check chain emails, which took the No. 4 position. (Technically, chain emails don’t represent one individual, but we’re including them on this list due to their enduring and distinctive presence in our inboxes.) Chain emails earned the highest percentage of Pants on Fire ratings in the top 10, with a whopping 57 percent of statements getting the flames. We also fact-check governors quite a bit, especially in places where we have PolitiFact state sites. PolitiFact Texas, PolitiFact Florida, PolitiFact New Jersey and PolitiFact Wisconsin have fact-checked their respective governors enough times so that Rick Perry (No. 5), Rick Scott (No. 6), Chris Christie (No. 7) and Scott Walker (No. 9) all appear on the list. Of the elected officials on the top 10 list, Perry had the highest percentage of Pants on Fire ratings, with 10 percent of his statements getting the flame. 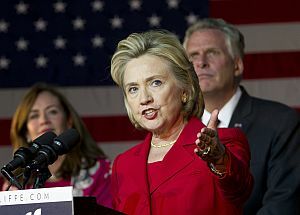 Former presidential candidate Hillary Clinton made the list, and will no doubt move up from her No. 8 ranking if she runs for president in 2016. PolitiFact Florida frequently fact-checks Republican Sen. Marco Rubio, widely considered a rising star in the Republican Party. He rounds out the list at No. 10.